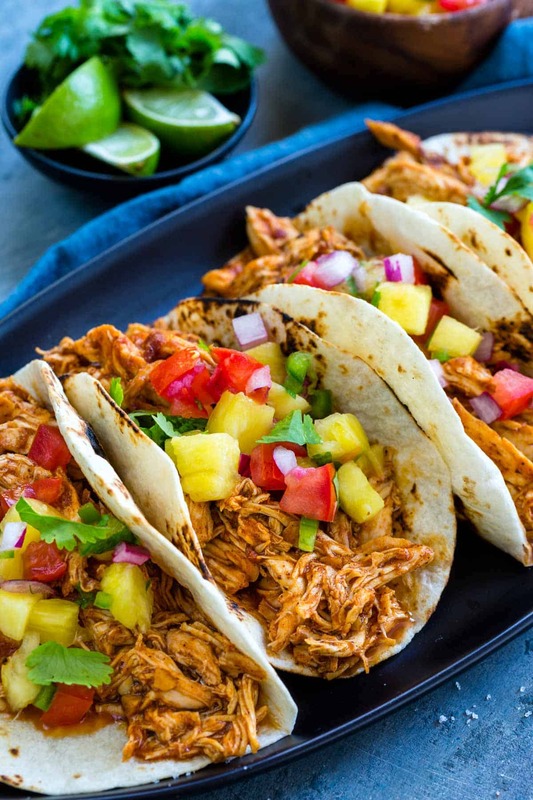 Slow Cooker Chicken Tacos with Pineapple Salsa! 16 Nov Slow Cooker Chicken Tacos with Pineapple Salsa! These slow cooker chicken tacos make for an easy Mexican feast any day of the week. In a medium-sized microwave-safe bowl combine olive oil, garlic, chipotle, chili powder, coriander, and cumin, microwave for 30 seconds. Add spice mixture, tomato sauce, maple syrup, and salt to the slow cooker, stir to combine. Season chicken with salt and pepper, add to slow cooker and coat both sides with sauce. Cover and cook on high setting for 2 hours, or low setting for 3 to 5 hours, until the internal temperature reaches 160°F. Transfer chicken to a plate, shred with two forks and place back into the sauce, stir to coat. Add in lime juice and stir to combine. Warm the tortillas and fill them with about 1/4 cup of shredded chicken. Garnish tacos with cilantro, serve with limes and any additional toppings. A vibrant blend of sweet pineapple, tomatoes, jalapenos, lime juice, red onion, and coriander gives this salsa so much flavour! It is great in tacos or even served with corn chips.